In 2011, Greg La Mantia, a wealthy beer distributer, purchased Needmore Ranch from John O'Quinn, a Houston trial lawyer who infuriated locals when, after purchasing the ranch, he closed off public access to Fern Bank Springs, a favorite local swimming hole. In 2013, locals would once again be outraged at the ranch's owner--this time Greg La Manita--when he successfully lobbied State Representative Jason Isaac and Senator Donna Campbell to pass legislation, despite widespread local opposition, creating a municipal utility district (MUD) on the ranch. For more details, read this article published in the Texas Observer. To appease the community's concerns that development of the ranch would deplete groundwater in the Trinity Aquifer, Representative Isaac and Senator Campbell included a provision in the Needmore Ranch MUD enabling legislation prohibiting Needmore from pumping Trinity groundwater for use in a residential subdivision on the ranch. Read more here. Fast forward another two years. 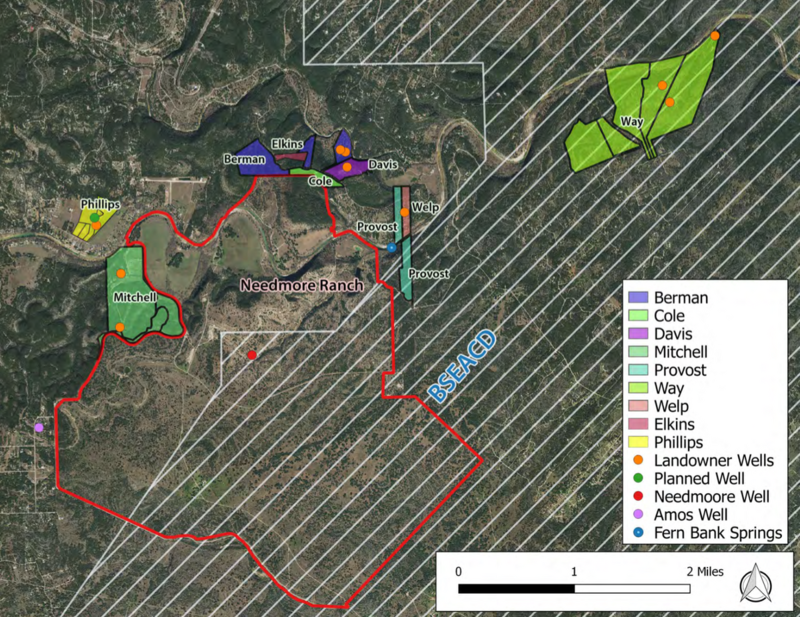 In early 2015, the Wimberley and Driftwood community learned that Electro Purification (EP), a private groundwater developer, planned to pump almost 5 million gallons of groundwater a day from an unregulated portion of the Trinity Aquifer. Because the area was not regulated by a groundwater conservation district, there were no laws in place to protect the property rights of nearby landowners whose wells were threatened by the massive pumping project. The Rule of Capture, an archaic law adopted by the Texas Supreme Court in 1904, prohibited neighboring landowners from suing to protect their groundwater from being drained. Click here for more information. TESPA formed and filed a lawsuit against EP and the landowners who leased their groundwater rights to EP arguing that the court should overturn the rule of capture. Locals galvanized and urged Representative Isaac and Senator Campbell to pass legation during the 84th session (House Bill 3405) extending the jurisdiction of the Barton Springs Edwards Aquifer Conservation District (BSEACD) over the unregulated portion of the Trinity Aquifer in Hays County. The bill had a controversial life during the 84th session, dying on the floor of the house as a result of a point of order, only to be resurrected at the last minute by an exceedingly rare decision by the House Parliamentarian to reverse the point of order. Read here for more details. Prior to House Bill 3405 becoming law, the eastern half of Needmore Ranch was in the unregulated portion of the Trinity Aquifer. The western half of Needmore Ranch, however, has always been within the jurisdiction of the Hays Trinity Groundwater Conservation District (HTGCD). After passage of House Bill 3405, BSEACD and HTGCD now bisect Needmore Ranch, with the eastern half within BSEACD's territory and the western half within HTGCD. For reference, see the map, below. A little known fact is that when House Bill 3405 passed, a bill authored by Senator Campbell (Senate Bill 2075) also passed. Senate Bill 2075 repealed the language in the Needmore MUD enabling legislation prohibiting Needmore from pumping groundwater from the Trinity Aquifer for a residential subdivision. House Bill 3405, which became effective on June 19, 2015, created a process where landowners operating a well prior to passage of the law, could apply to BSEACD for a production permit for the “maximum production capacity” of the well. On September 19, 2015, Needmore applied to BSEACD for a Temporary Permit and a Regular Permit to produce 289,080,000 gallons of groundwater a year from the Trinity Aquifer. Click here to read the permit applications. This volume of groundwater is what Needmore determined is the maximum production capacity of the well on the ranch. On October 19, 2015, BSEACD issued Needmore a Temporary Permit for approximately 180,000,000 million gallons a year, maintaining that this was the correct maximum production capacity of the well. To read more about BSEACD's findings, check out BSEACD's website, which has a time line and links to relevant documents related to Needmore's Permit. House Bill 3405 prohibited hearings on Temporary Permits, but TESPA filed comments in opposition to the BSEACD's issuance of a Temporary Permit to Needmore. Click here to read TESPA's press release. BSEACD is now going through the procedural process under House Bill 3405 of converting this Temporary Permit into a Regular Permit and has issued a proposed permit to Needmore for 289,080,000 gallons a year – the maximum production capacity of the well as originally requested by Needmore. However, BSEACD has issued with permit with special conditions requiring Needmore to reduce pumping based on measured drawdown in the monitoring well. Needmore's request for 289,080,000 gallons of water a year is excessive. It would cover the 5,000 acre ranch in about 2 inches of water. It is enough water for over 39,000 head of cattle at 20 gallons per day per head. This magnitude of withdrawal is equivalent to 792,000 gallons a day, which would provide for 5,280 households assuming a daily average household usage of 150 gallons a day. The aquifer test conducted by Needmore's hydrogeologist, Wet Rock Groundwater Services (the same hydrogeologist that works for Electro Purification) resulted in fourteen feet of drawdown from a monitoring well 1.95 miles from the well on Needmore Ranch. BSEACD's own modeling predicts that within seven years, pumping from the well on Needmore Ranch will cause 140 feet of drawdown in the Trinity Aquifer as far as two miles from Well D.
Despite the severe impacts this pumping will have on its neighbors, Needmore is arguing that BSEACD should not be allowed to require Needmore to reduce production. And even more outrageously, Needmore is arguing that nearby landowners should not be allowed to protest the permit. Read more about Needmore's arguments. On December 19, 2016, TESPA submitted a contested case request to BSEACD protesting Needmore's proposed permit and requested that the case be referred to the State Office of Administrative Hearings (SOAH). BSEACD referred the case to SOAH. Please check our Updates page for the latest updates regarding the contested case and legislation affecting Needmore Ranch.